Radio 390 was launched in 1965 to replace the failing King Radio. Despite having some good presenters and innovative programmes, it had quickly become apparent that technical inadequacies and a lack of professional expertise were going to stop King from making any headway - or any money. When Ted Allbeury took control, things changed rapidly. In preparation for the re-launch of the station, new presenters were appointed including Peter James who had learned his craft with the NZBC, the New Zealand equivalent of the BBC. Other, less experienced, announcers were sent out to King Radio to perfect their skills. They were heard on air during the last weeks of the old station. Meanwhile new studios were built to Peter's suggested lay-out, RCA installed a 10 kilowatt transmitter and a massive 297 ft. aerial mast was erected on top of one of the fort's towers. At about 4pm on 23rd September 1965 the new station, Radio 390, began test broadcasts on 773 kilohertz. The first track played was Glenn Miller's Moonlight Serenade. On the 25th September regular programmes began. Among the presenters staying from King were John Ross-Barnard, Mike and Mandy Raven, Sheldon Jay, Mark Hammerton, Paul Beresford (previously known as ‘Paul Levy’), Brian Cullingford (previously ‘Bruce Ford’), John Stewart (later to be ‘John Aston’) and Stephen West. Ted Allbeury originally planned to call the station ‘Radio Eve’ to emphasise the female target audience. However he decided that it was more important to indicate how to find the station on the radio dial so it became Radio 390 (the station broadcast on 388 metres). The Eve name was still used though: the daytime programmes were collectively referred to as ‘Eve, the woman's magazine of the air’. 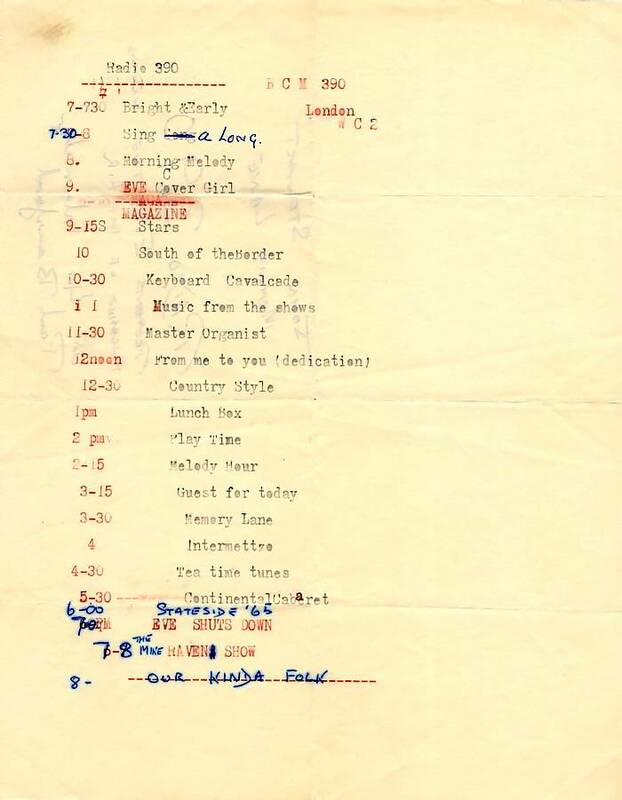 John Aston has kept an early programme schedule, see below, which shows that Eve operated from 9am to 7pm. Press advert for Radio 390 advertisers. Some of the early Radio 390 presenters. Left to right: John Ross-Barnard, Sheldon Jay, Edward Cole, Mark Hammerton, Brian Cullingford, Paul Beresford, Peter James and, kneeling at the front, Robert Randall. 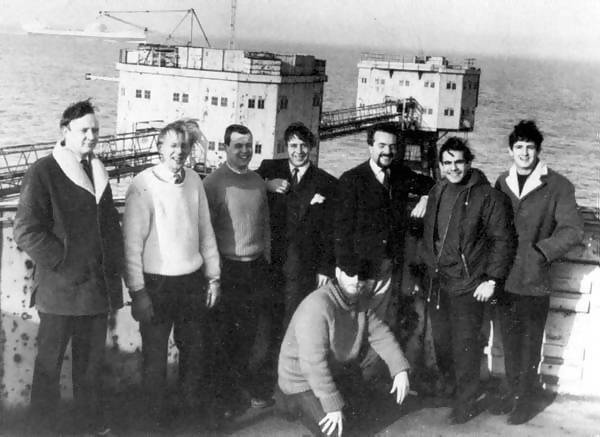 Photo originally from the ‘Kent Messenger’, reprinted in ‘Offshore Radio’ published by Iceni Enterprises. Click to enlarge. Early programme schedule. Click to enlarge. As with its predecessors, 390 was basically a sweet music station but, as it grew, other programmes were added to the mix. There was a daily serial, Doctor Paul, imported from Australia and bravely scheduled opposite the BBC Light Programme's long-established Mrs. Dale's Diary; and there were shows devoted to musicals, blues, country and light classical music. While other offshore stations had shows lasting two or three hours, Radio 390's schedule, left, contained a number of short programmes. This was more like a BBC schedule than an offshore one. And, although slightly more warm and informal, the presenters had an almost BBC-ish style too, even to the extent that at the end of each show one of the presenters would give a credit (“South Of The Border was introduced by....”) in the manner of a continuity announcer. 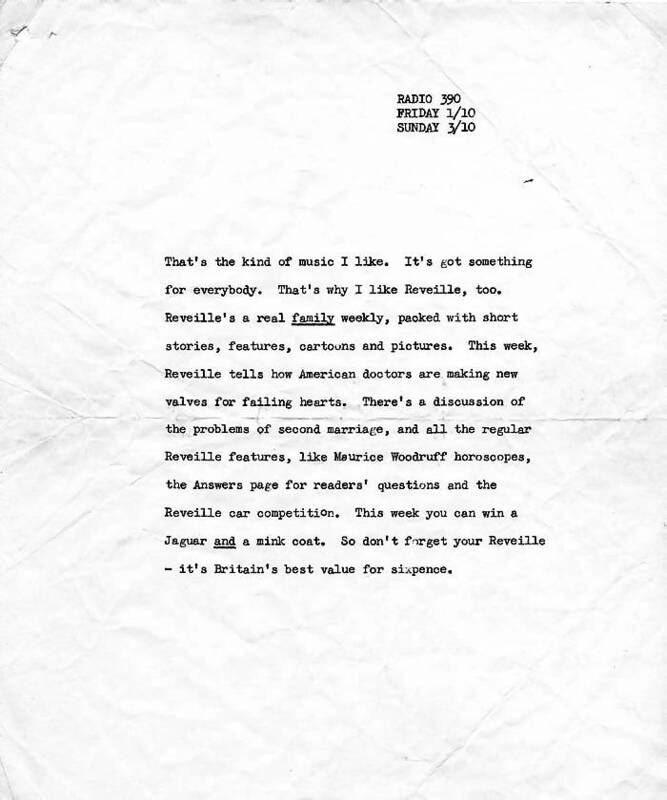 Script for an early Reveille advert. Click to enlarge. However old-fashioned it sounded, it worked. Radio 390 was an immediate success, especially with housewives. Almost all the other pirates were concentrating on playing pop music but here was something different. And it had a very strong signal. After only three weeks on air the station was receiving some five hundred fan letters a day. By May 1966 National Opinion Polls estimated the station's audience as 2,633,000. The first advertiser was the magazine Reveille, the second was The News of the World and soon the revenue was flowing in, from major national advertisers and local businesses. One of the station's biggest campaigns was for the launch of Mother's Pride bread. 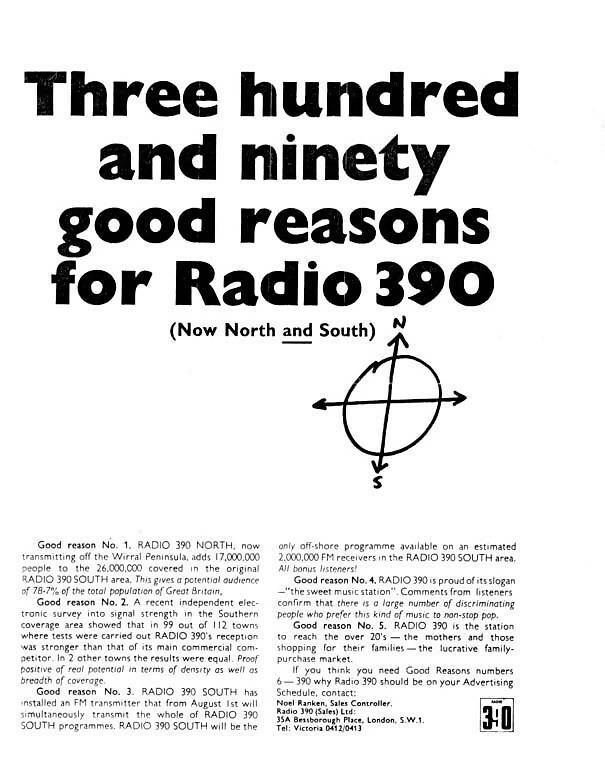 Trade press advert for Radio 390 North. Click to magnify. The station was such a success that during 1966 the management made plans for a northern sister station. They also hoped to add an FM outlet in the south. Neither ever happened although a two-station rate card and trade press advertisements were published. It was intended that the northern station would come from the mv Cheeta II, formerly home of the Swedish Radio Syd (and recently borrowed by Radio Caroline). An anchorage off Colwyn Bay was selected. Presenters were instructed to record their shows while they were being transmitted on the south station so that the tapes could be re-broadcast in the north. Unfortunately on 21st July the Cheeta II broke her moorings in a storm and drifted towards a sandbank. She was rescued but a legal battle over salvage rights caused Radio 390 to call the deal off. It is not known why plans for the FM service were abandoned but it might have been because, in September 1966, the station was charged with breaking the Wireless Telegraphy Act by broadcasting inside territorial waters. 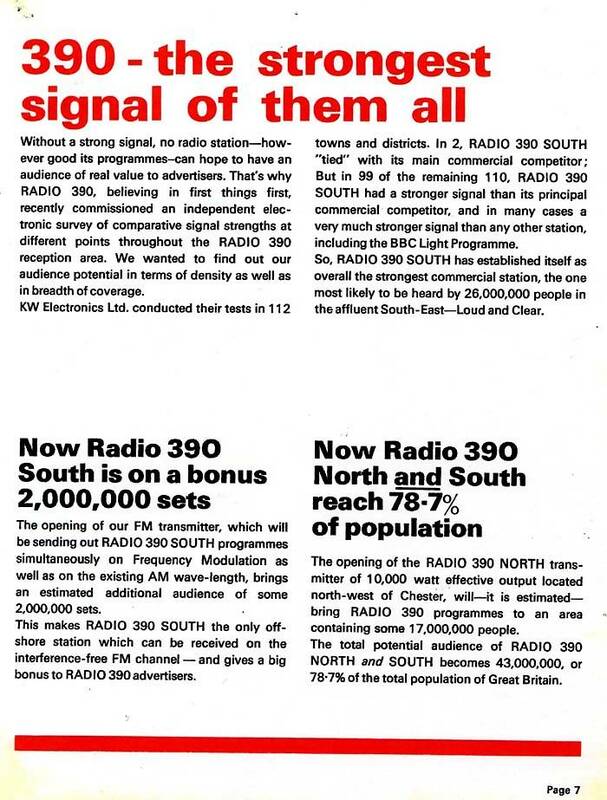 Trade press advert for Radio 390 North and 390 South on FM. Click to magnify. On 25th.November, in a Kent court, the station was fined £100. Radio 390 closed down. After an appeal to the High Court on 12th December failed, the station remained silent. 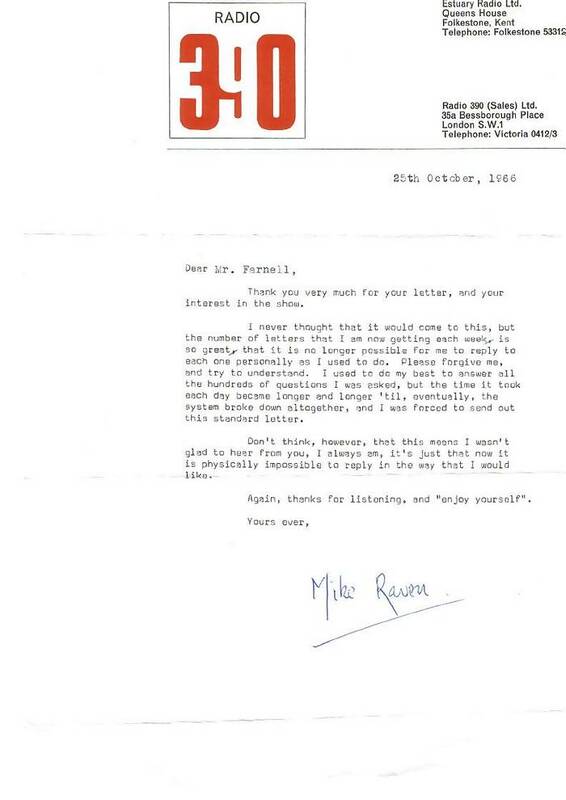 Letter from Radio 390 presenter Mike Raven. Click to magnify. At that time UK territorial waters extended three miles round the coast. Despite being over three miles from land, Radio 390's Red Sands Fort was only one and a half miles from a sandbank called Middle Sands. Because this Middle Sands was inside UK waters, the prosecution argued the three miles had to be measured from it, rather than from the coastline. This made Red Sands inside British waters and therefore inside the court's jurisdiction. 390 was not going to be silenced so easily. While off the air a marine survey was commissioned. This showed that Middle Sands was normally under water and therefore, it was argued, could not be used as a base for measuring the three mile limit. That made Red Sands outside territorial waters. On New Year's Eve 1966, just before midnight, Radio 390 returned to the air with Frank Sinatra's Second Time Around. The Post Office, then responsible for policing Britain's airwaves, was not prepared to let the matter rest. On 17th February Radio 390 was back in court. 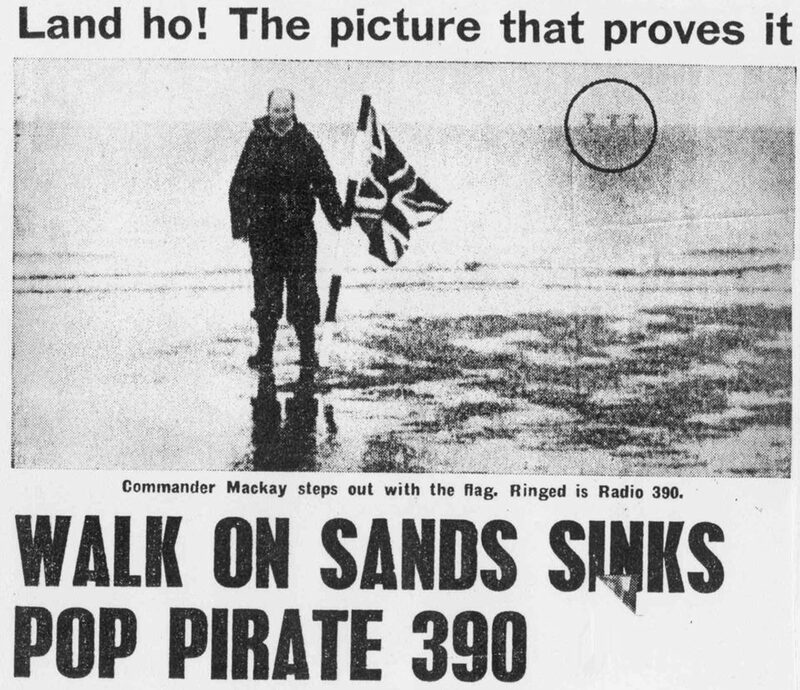 The prosecution displayed a photograph of a man, one Lieutenant Commander John Mackay, standing on the disputed Middle Sands, holding a flag and obviously very much above sea-level (see cutting below). 390 was again found guilty and fined another £200. In addition the company directors were each personally fined a further £40. However the station stayed on the air and lodged an appeal. In March the Post Office sought an injunction to force Radio 390 to stop broadcasting. This was granted in May but the station was given permission to appeal and, in the meantime, it kept going. The appeal was heard on 28th July 1967. Yet again the station lost. That evening at 5pm Graham Gill read a news bulletin. At the time the result of the court case had not reached the fort so was not reported. A pre-recorded edition of the station's only pop programme, On the Scene presented by Christopher Clark, then began. Meanwhile a tender arrived bearing the bad news. After just one record the show was interrupted by senior announcer, Edward Cole who revealed the court's verdict. At 5.10pm Radio 390 closed down for the final time. Radio 390 had cost £150,000 to launch and, although it had made a lot of money during its short life, the continual and costly legal battles had drained the coffers. The station closed down having just about broken even. Nobody got rich. But although Radio 390 had not been a huge financial success, it had proved that there was a demand for a commercial non-pop music station and, in terms of the programming and the audience figures, it had been a triumph. For more on the station's closedown, see here. Information from Offshore Radio by Gerry Bishop, published by Iceni Enterprises. Lieutenant Commander Mackay, standing on Middle Sands. Press cutting shared on Facebook by Alan Racheter‎. With many thanks to John Aston, Mark Hammerton, Hans Knot, Jonathan Shirley and Bob Stevenson for the documents and to RBL, Offshore Echo's, The Offshore Radio Archive, Ray Andrews, Nick Widdows, Dickie Bird and Lynne Sims (from the Martin Lynch collection) for the recordings. For pictures taken on Radio 390, see Peter Berkeley's, Edward Cole's, Roger Scott's and David Sinclair's photo albums.